Blarney Castle is a medieval stronghold in Blarney, about 8 kilometres (5 mi) from Cork, Ireland. 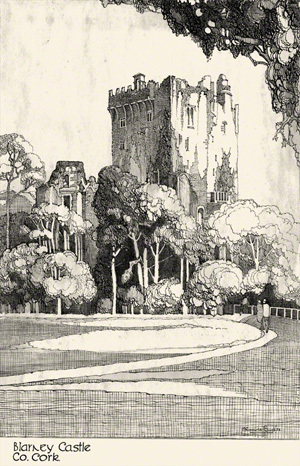 In this pen and ink drawing by Claude Buckle the castle is captured as it looked in 1933. Famous for the Blarney Stone. This is a block of bluestone built into the battlements of Blarney Castle, Blarney. According to legend, kissing the stone endows the kisser with the gift of the gab (great eloquence or skill at flattery). The stone was set into a tower of the castle in 1446. The castle is a popular tourist site in Ireland, attracting visitors from all over the world to kiss the stone and tour the castle and its gardens. The view in the pencil sketch is from the north side of the castle. Created in 1933.